In celebration of NARS 15th anniversary, François Nars will be making a special personal appearance at Saks Fifth Avenue – signing copies of his books X-Ray and Makeup Your Mind as well as the limited-edition NARS Loves New York Set. X-Ray (1999), the wildly successful photography book and collector’s item, Makeup Your Mind (2001), the ultimate instructional makeup manual featuring the world's most recognizable models and the NARS Loves New York Set containing an assortment of four classic products resurrected from the archives by François Nars specifically for the women of New York and re-named after iconic names in the city, will be available for sale at the NARS counter during this time. 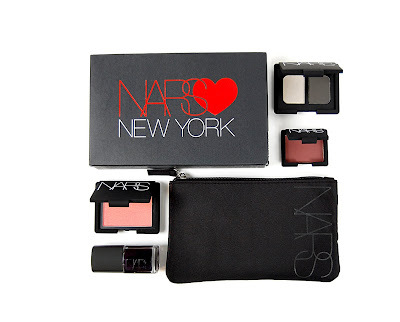 A talented team of NARS makeup artists will also be offering customers in-store consultations with the NARS Loves New York Set and the Fall collection. GAH, I need to live in NYC, everything glorious happens there. What shades are included in the set? Will these products only be sold in NYC? Prime: Me too. Me too. Joey: I love your post at Pink Sith! Everyone go and look! BTW: You hair is beyond magnificent. It is drool worthy. Kerri and Anon: Let me check and get back to you. Lacroix: Did you go? Spill the deets! Can you buy this set from SAKS online or do you need to go to the store in person?